Want to get your kitchen organized without spending a lot of money? 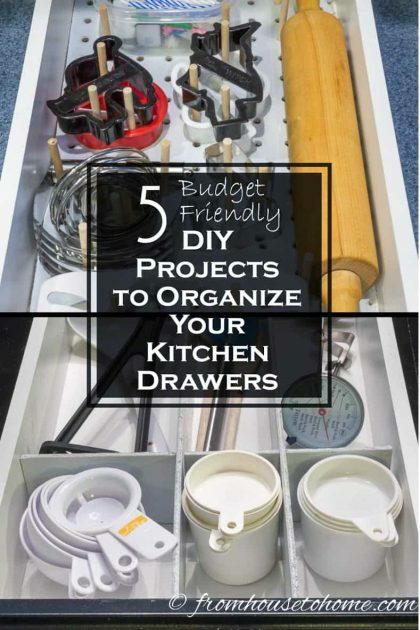 Try out these easy DIY kitchen drawer organizer ideas. 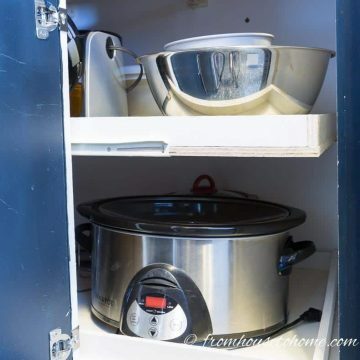 In my quest to get my kitchen organized, I have used cabinet door organizers, a magnetic spice rack, and built an over the refrigerator cabinet organizer. 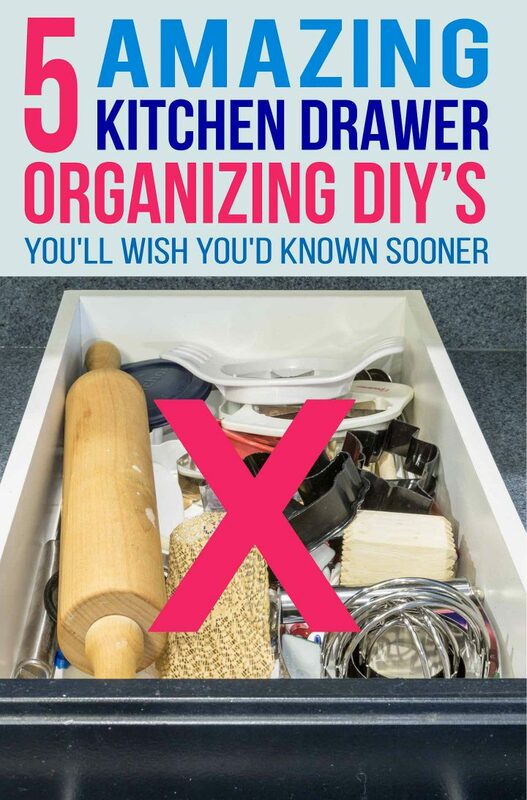 These DIY kitchen drawer organizer ideas are the next step to getting everything in order. I don’t know about you, but no matter how I try, my kitchen drawers always end up in a mess with a jumble of cooking utensils. I can never find what I’m looking for, and everything is so hard to get at. So I finally decided that enough is enough. I have to do something! 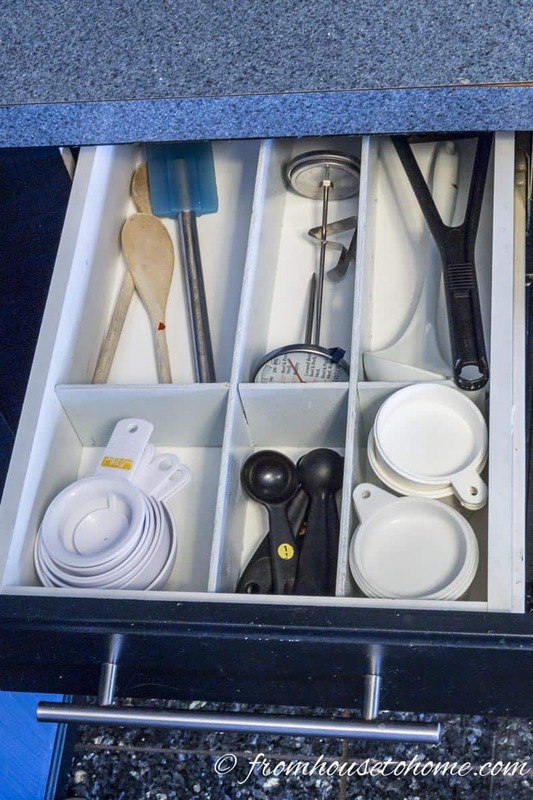 But the big question is…How can I keep my kitchen drawers organized? The problem is that the standard sized drawer organizers you buy just don’t fit in my kitchen cabinets. Which means I have to resort to making DIY kitchen drawer organizers. And that isn’t really as bad as it sounds. First most of these aren’t difficult projects to do. And it means that all of my drawers have storage that is custom made for what I want to put there. 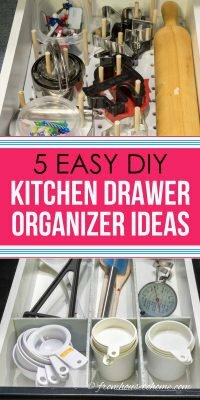 So I thought I would share my favorite DIY kitchen drawer organizer ideas in case you want to create custom storage for you kitchen, too. 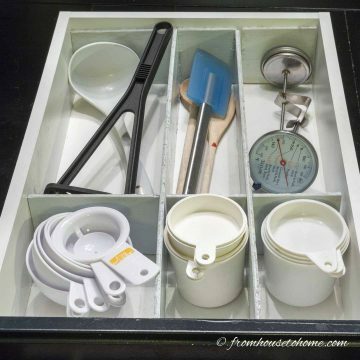 In my opinion, drawer dividers are a must in pretty much all drawers…whether they are in the kitchen, bathroom or my desk. Building custom-sized drawer dividers that exactly fit what you need to store makes them even more useful. And given the fact that DIY drawer dividers are really easy to make, there’s really no excuse for not having your own! Find the tutorial for how to make your own custom wood DIY drawer dividers HERE. Baking utensils are another thing that I like to store in my kitchen drawers but don’t really fit into the standard drawer dividers that well. Which is where my other favorite organizing material comes into handy…pegboard! 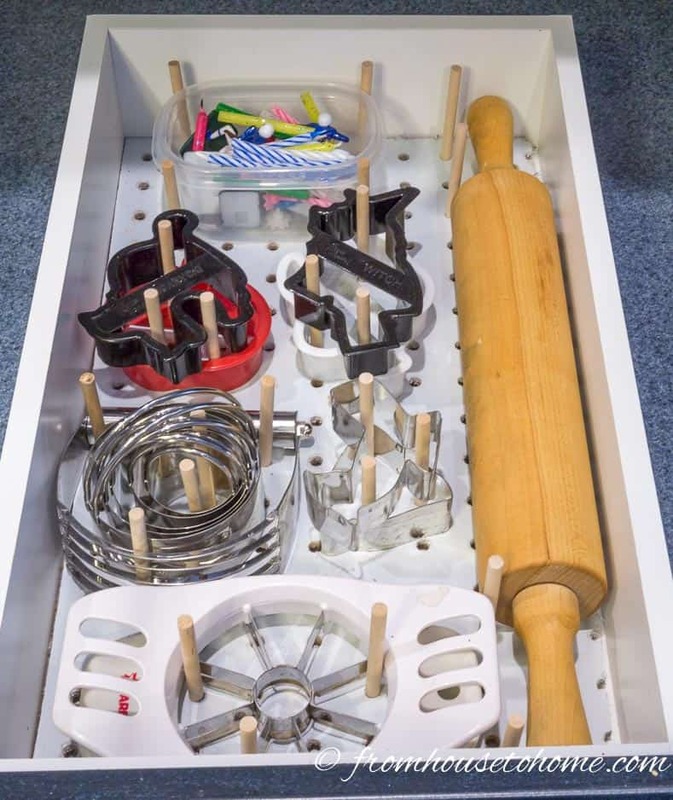 Installing some pegboard on the bottom of the drawer with some dowels lets you configure your drawer storage perfectly for storing things like cookie cutters, a rolling pin, biscuit cutters, and apple slicers. You can find the step-by-step instructions for my custom pegboard DIY drawer organizer HERE. 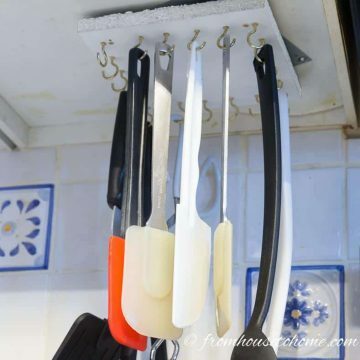 If you have larger drawers, you can also use a version of this to keep sets of dishes in place. You’ll need stronger constrution since the drawer is larger and the contents are heavier…See the step-by-step instructions at queenbeeofhoneydos.com. Next up on my list of DIY kitchen drawer organizer ideas is to build a spice rack in a drawer. 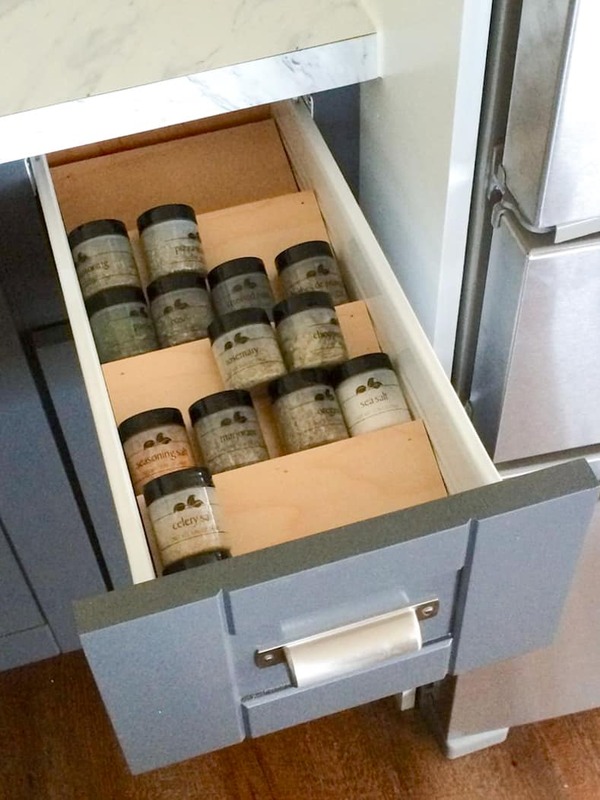 All you need is a few scraps of plywood, and you can build your own drawer spice rack like this one from ana-white.com. 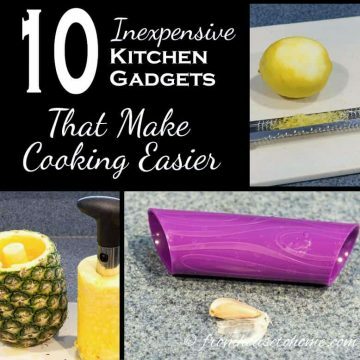 It is a really easy project that doesn’t cost a lot of money. 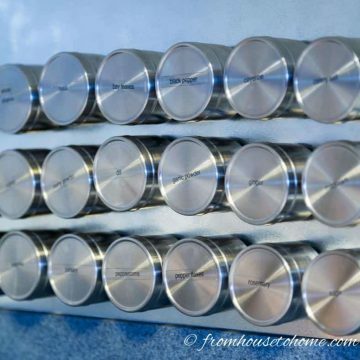 Since I’m happy with my magnetic spice rack, I didn’t do this project, but if you have a drawer that is conveniently located, it is one way to make your spices easy to find. Another great DIY drawer organization idea (that I haven’t done, but I will if I can find a spot for it) is to build a knife block into one of your drawers. This gets the knife block off the counter…and still makes the knives easy to find when you need them. And if you happen to have little ones running around, “hiding” them in a drawer makes it harder for them to find. 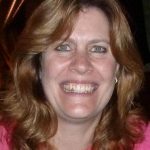 Check out these simple instructions from whilewearingheels.blogspot.com to learn how to make a knife block for your drawer. 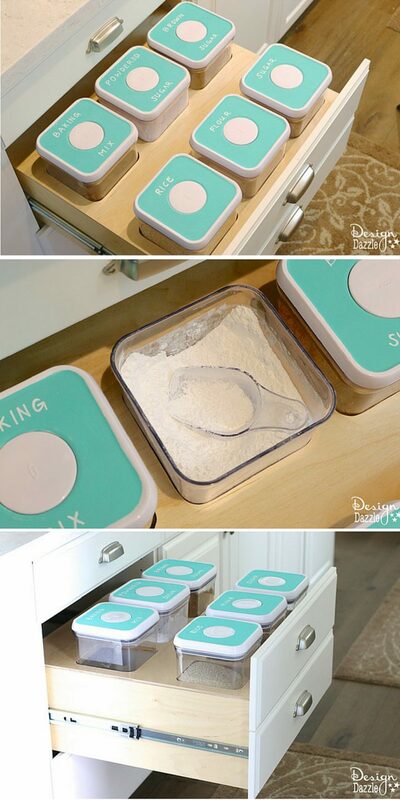 The last one of my DIY kitchen drawer organizer ideas makes your baking supplies easy to access. If I had enough drawer storage space, I would totally make this baking goods drawer organizer from Toni at Design Dazzle. 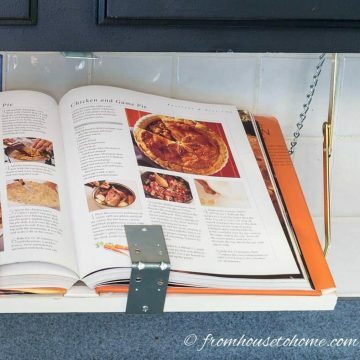 How awesome is this for keeping those supplies close at hand but out of sight? Get more details about this project HERE. 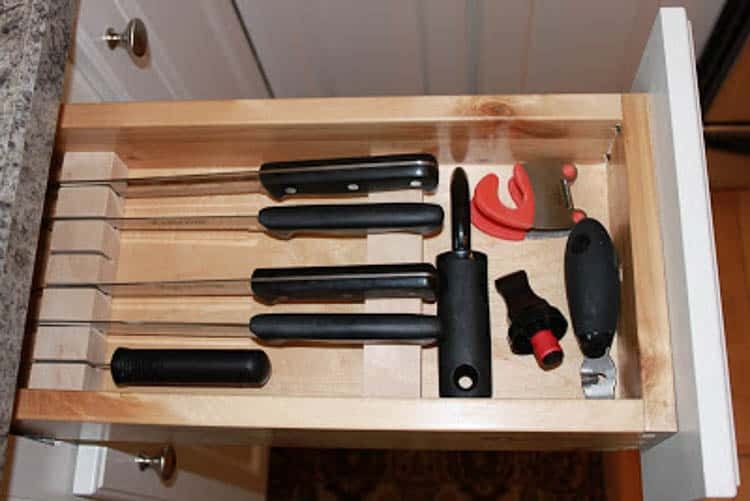 Have comments or questions on our DIY kitchen drawer organizer ideas? Tell us in the section below. Hi Wanda. Why do u have to screw in the pegboard? Hi Jamela…it isn’t absolutely necessary to screw in the pegboard. It just prevents it from shifting when you open and close the drawer (but if you cut it so that it just fits in the drawer that shouldn’t be an issue).